This blog was originally published by the Huffington Post. Access the original article. As the year draws to a close, and we are gearing up for the holiday season in many parts of the world, we launch the Annual Scaling Up Nutrition (SUN) Movement Progress Report, which takes stock of many successes and sets the scene for our next New Year’s Resolutions. One final thing on my ‘to do’ list for 2016 is to mark Human Rights Day, which focuses on standing up for someone’s rights. After a tumultuous period for the commonly agreed rights of all women, men and their families, everywhere, I want to single out a human right we often forget: the right to food. What exactly is meant by the right to food? Does it mean just any food, nutritious food, or does it also include good food? The right to food is recognized in the 1948 Universal Declaration of Human Rights as part of the right to an adequate standard of living, and is enshrined – along with the fundamental right to be free from hunger – in the 1966 International Covenant on Economic, Social and Cultural Rights, which 50th anniversary we celebrate today. This right cannot be interpreted narrowly – adequacy, in this context, means that food must satisfy the dietary needs of a given individual. Women, especially those of a reproductive age, for instance, have specific dietary needs, which is why the spotlight must be on good nutrition in the 1,000 days from the start of a pregnancy to a child’s second birthday, as it sets the foundation for all the days that follow. If the food given to a young girl or boy does not have the right nutrients for their physical and mental development, it’s not adequate. Adolescents, older women and men, those living with HIV and AIDS, all have specific nutrient requirements that they have a right to have met, too. So why do we still need to speak up and speak out for the right to food – in the North and in the South, alike? Two billion people still lack essential vitamins and minerals in their food, 1.9 billion adults are overweight or obese, and nearly six million girls and boys die every year from malnutrition or related diseases, representing about half of all preventable deaths. How can this be when the world produces enough (nutritious) food to feed everyone, you may ask… I know I do. But it is not all doom and gloom: 2016 has been important in the fight against malnutrition. As shown in our Progress Report, many countries, such as Bangladesh, Cameroon, the Congo, El Salvador, the Gambia, Lesotho, Nepal, Nigeria and Swaziland, have, in the past year, greatly reduced the number of girls and boys under five who are too short for their age or stunted – a manifestation of chronic undernutrition. New figures show that the number of stunted children around the world is now at 156 million, 3 million less than in 2014. 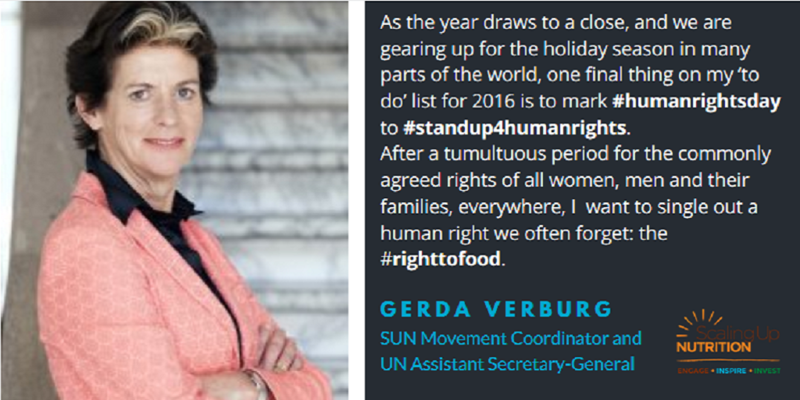 The SUN Movement is a renewed global effort to eliminate all forms of malnutrition, everywhere, based on the principle that everyone has a right to food but also good nutrition. It was founded in 2010, not as a new programme or project, but a collective commitment of the global governance system for nutrition “to make the most of diverse experience, expertise and resources and foster coordination in support of country-led efforts to scale up nutrition”. Today, it is driven by 57 countries and 3 Indian States, who have committed to scale up their nutrition efforts, with thousands of public and private partners joining forces, which should bode well for nutrition in 2017, and beyond. In 2016, a third of all SUN Countries have the right to food enshrined in their Constitution, which is no small feat. Many more have realised the value of helping consumers choose the right food for them and their families, by, for instance, putting in place legislation that ensures that staple foods such as oils, salt and grains offer families maximum nutritional value. Today, 44 SUN Countries have some form of legal measure related to the marketing of breast milk substitutes, recognizing that breast milk has the power to give girls and boys the best possible start in life. So, in many ways, things are looking up. With the adoption of the 2030 Agenda for Sustainable Development by 193 countries all over the world committing to also eradicate hunger and eliminate all forms of malnutrition, we have to work differently, in tandem, for people and planet, alike. Although, as Nobel Peace Prize Laureate Norman Borlaug stressed “almost certainly, however, the first essential component of social justice is adequate food for all”. We have learnt (the hard way) that the vicious cycle of poverty, gender inequality, poor sanitation and lack of safe drinking water fuels the malnutrition fire and must be fought in parallel for the right to food to be actualized. After all, at least 12 of 17 Sustainable Development Goals require good nutrition in order to be met. Which brings me to another 2016 nutrition highlight: the launch of the UN Decade of Action on Nutrition (2016-2025) marking a new direction for nutrition everywhere, through ownership, through concrete commitment and through effective action, by all stakeholders. So if you are to gather with your colleagues or loved ones today or in the period ahead – at work, in school, or around the dinner table – help someone whose voice is rarely heard to share their views and act on the right to food. Stand up for their rights, our rights, your rights, today, tomorrow and always. I wish you and yours a happy and nutritious end to 2016 and year ahead.